Are you a poet? 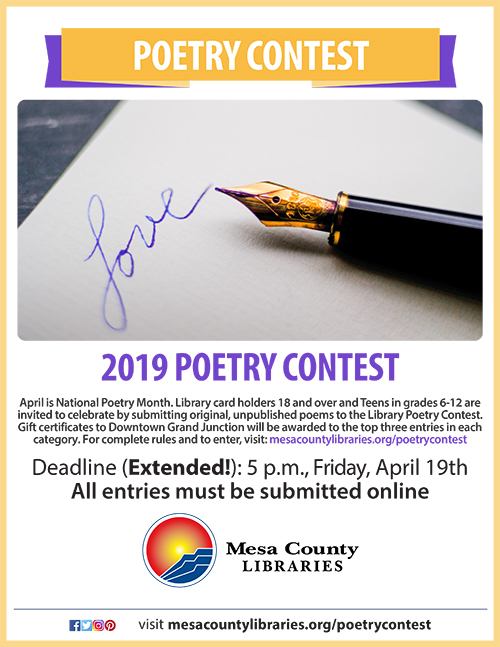 Enter your best work in the Mesa County Libraries 2019 Poetry Contest! The Poetry Contest is an annual contest that seeks to recognize Mesa County’s best poets! The contest features separate categories for adults (18 and older) and teens (grades 6-12). Poets are invited to submit as many as two original, unpublished poems by 5 p.m. Friday, April 19th (deadline extended), for a chance to win prizes and have their poems featured on the library’s website. Authors of the top three poems in each category will win Downtown Grand Junction gift certificates. Entries must be submitted online using the official entry form available at mesacountylibraries.org/poetrycontest. No poems will be accepted in person, in any format, at any library location. Poems cannot exceed 40 lines, and they must be suitable for a general audience. Complete rules are available on the library’s website. For more information, call 970-683-2408 or email ctaylor@mcpld.org. The Teen contest will be judged by Noel Kalenian, librarian at Mesa County Libraries and a published poet. Be sure to set aside time at 5 p.m. Tuesday, May 21st (date changed from April 30), to attend the Poetry Contest Awards Ceremony at the Central Library. Posted in Branches, Crafts and Hobbies, General, Library News, Teens.